Gurpreet Singh Sandhu, Pritam Kotal (Lalruatthara – 91st), Sandesh Jhingan, Anas Edathodika, Subhasish Bose (Narayan Das – 91st); Udanta Singh (Ashique Kuuruniyan – 80th), Pronay Halder, Anirudh Thapa (Laldhanmawaia Ralte – 93rd), Halicharan Narzary (Rowllin Borges – 61st), Sunil Chhetri ©, Jeje Lalpekhlua (Balwant Singh – 61st). Sunil Chhetri had scored twice on another exultant night as he climbs to joint third on the list of the highest active international goalscorers in football before equalling Leo Messi’s record today. He will enjoy that, too, but the real prize here was to be part of a side that has now lifted the Hero Intercontinental Cup in front of his home fans. The opening goal came in the just 8th minute from a well-executed training ground drill from a free kick. Anirudh Thapa delivered a cutback instead of the anticipated cross from the free-kick just outside the box. The innovation caught Kenya defender by surprise as their defenders left diminutive Sunil Chhetri unmarked from the set-piece at their own peril as the Captain delivered yet another sublime finish to give India a 1-0 lead in the final. The magic wasn’t over for the night, as Sunil Chhetri produced another moment of magic to control Anas’s long with a sublime chest down to outrun his marker and tuck it as past rival Goalkeeper Patrick Matasi to put India 2-0 ahead in the just 29th minute. Kenya threatened intermittently through Ochieng but lack of quality and finishing in the attacking third let them down. Kenya used their physicality but failed to contain India’s attack down the channels and burst of speed from Narazary and Udanta kept Kenyan backline busy all night. Kenya looked a better side in the second half attacking down the right but their attacking lethality was repulsed by resolute defending from Anas and Sandesh Jhingan while Subhash Bose has yet another outstanding game. 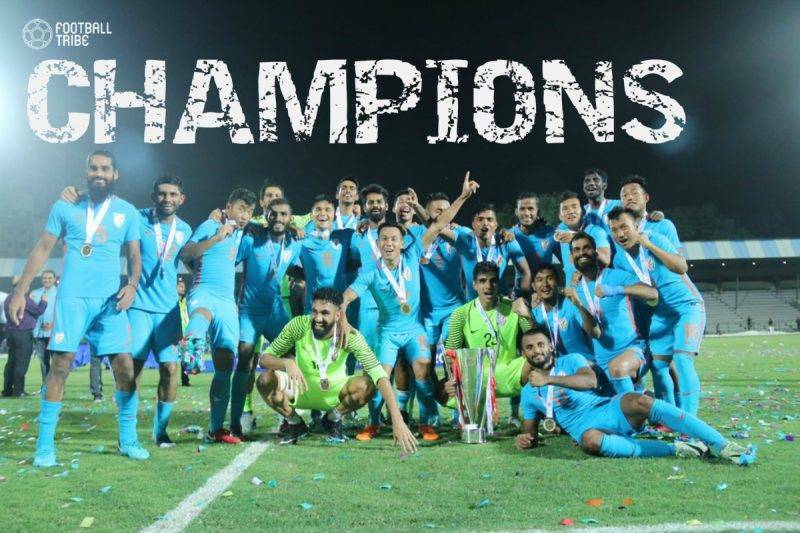 Gurpreet Singh was called out for action for a couple of times and was solid beneath the bars as India clinched a 2-0 win to win the Hero Intercontinental Cup 2018. It ended, as it so often does, with that familiar smile of Captain Sunil Chhetri leading the Viking Claps of Blue Pilgrims at the Andheri Football Arena on Sunday. Sunil Chhetri’s – sweat-soaked blue jersey, fist pumps, magic in his boots – will never forget the night he scored the 64th International goal of an almost implausible career to climb to joint third on the list of the highest active international goalscorers in football before equalling Leo Messi’s record today. The trio of Chhetri-Jeje and Udanta produced yet another eye-catching display with their holding play, releasing the ball and fast attack on the counter with their almost telepathic understanding to take the Kenyan defence by storm.But India lacks a big tall striker a target man, should they be chasing a game in the AFC Asian Cup deep into the game. The emergence of Anirudh Thapa and Pronoy Halder in the midfield produced yet another stellar performance will surely add steel to the central pitch with their contrasting style of play yet complimenting each other. Anirudh Thapa is definitely a star in the making. Sandesh Jhingan and Anas have been solid at the back keeping yet another clean sheet but their defending has some gaps that need to be plugged before AFC Asian Cup 2019 which bigger teams like UAE or Thailand can exploit. Subhasish Bose was once again the stand out man in the defence playing in the left-back role he pocketed Kenya’s Ochieng throughout the game while defending or overlapping going forward to provide crucial cross to feed the forward line. Holicharan Narazary and Udanta once again impressed with their run down the flanks while dropping down deep when needed to help the fullbacks defending.